We had a great time tonight with wonderful friends at the Fehrenbachs! Laelia loves all the attention that the big-family atmosphere provides. At one point everyone clapped when she did something then awed when she did something else. My child loves to perform for this audience! I need to get more pictures of her and baby Chris together for next time. After all the excitement was over, Laelia sang and wiggled and yelled “Aa-DOM!” (the way she says Adam) over and over the whole 30 minute drive home. So cute! It’s official. We’re losing our respite services because of “severe and painful” (according to a letter we received) budget cuts in California. So far from what we know (and all information is terribly communicated) we still qualify to send Laelia to school. So that’s good. 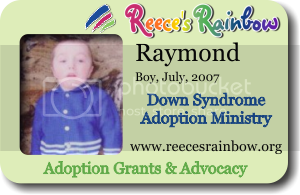 We have a pretty good network of friends now so this is not heartbreaking news, however there are many families with disabled kids who no longer have this support. Not that we won’t miss it terribly, but I’m not worried about us. California has made some bad financial decisions and needs to fix the problems somehow. We were thankful for the time we got respite services; it meant so much to us. Today I got home and walked into a clean house. My living room was picked up, all my stuff was organized and stacked, my kitchen was clean and Laelia was bathed from the waste up! Chelsea is my favorite friend/godmother/respite person ever! If it weren’t for a letter Chelsea had received letting her know when Laelia’s respite services were over, we would never have known! Even though the Regional Center sent over a letter via courier service that I had to sign for, it was still unclear. We read it through and couldn’t figure out if the cuts applied to us! And we aren’t dummies! They really needed to make that more clear. Can’t hold the girl back so we’re just letting her do her baby thing. She almost wiggled off the couch and would have fallen straight on her foot with the pin in it yesterday. (I taught her that move, but back when she wasn’t casted.) She is kicking stuff, including kitties! 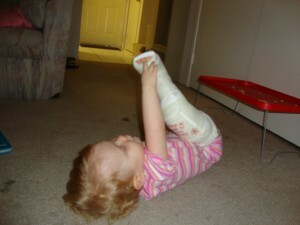 And she’s smacking her big cast into random things to hear the noises it makes. She’s pretty much a stinker. I am trying to hold her back from really hurting herself, but for most things I just let her go and do whatever. Diaper changes are also difficult post-surgery, and today while changing her diaper I snagged the diaper on the bandage over her hip on accident. 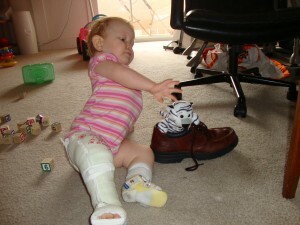 All she said was a quick and quiet, “Ouch,” and then she was back to giggling at something else. So forgiving so fast! I love her! Sabotaging Daddy’s shoes before he leaves for work. Don’t let the look fool you, she’s down to two pain meds a day! She’s just not happy that she can’t play anymore and has to go to bed. Boo! She’s doing really well. She played with Megan and Joshua today. Then Chelsea came over to do stretches and afterwards Laelia did stretches on her stuffed kitty. Later Lauren came over (with Ryan and dinner) and Laelia spit all sorts of food on her. So definitely back to normal behavior. Her teacher called and said they have a special cart to carry her and her cast around safely so she’s heading back to school on Monday! (For one day only before the next surgery.) I just have to put sunscreen on her head and a plastic bag around her cast and she’s good to go! I may even take her to the Brain Cancer walk on Saturday if she’s feeling up to it! We’ll see! 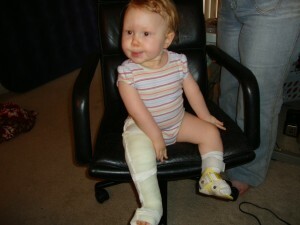 Is it my imagination or is her right, casted leg able to move towards the center better after surgery? See how her left leg is stuck out to the side? She always has her legs wide, unable to bring them together. I wonder how she’ll be after the IT band on her other side is cut? She will sit like a lady yet! Love the goofy face. 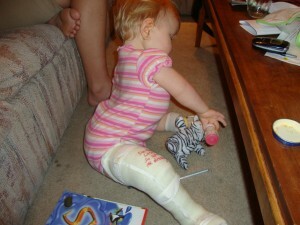 The cast starts right under where her hip surgery was and goes down to wrap around her foot. This is different than what we expected, but the doctor wants to try it. The split down the cast is to allow for swelling. 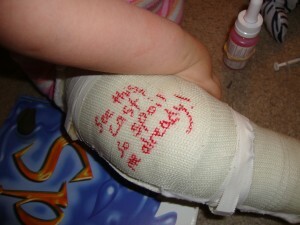 She will get it re-wrapped on the day of her second surgery. See this cast? So spoil me already! Laelia is doing loads better today. 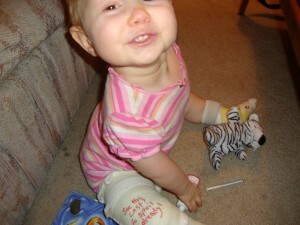 She has been playing and laughing and using all her strength to drag her casted leg around. She’s just a bit more fussy than usual and has no patience. But really if you didn’t know her, you wouldn’t know anything was wrong, because she’s acting just like a typical kid. Except I know how good she can be. Chelsea and I gave her a bath by wrapping her leg in a ziplock bag, Target bag over that, then a towel around that. Then we laid her down in the bathtub and slowly poured water on her from a pitcher while scrubbing her. Then it took her about ten minutes to get covered in squash and milk. :-/ But she’s doing so good! Kids really do bounce back fast! Thanks again for all the prayers! There were times when we should have been distressed, but we instead felt supernaturally calm and peaceful. Thank you! And I’m not sick anymore! And it looks like the scary letters we’ve been receiving from Regional Center may not apply to us! (They said they were taking our Respite services away and also implied that she may get kicked out of Early Start beause of California budget cuts, but so far nothing has happened.) So things are looking up up up! Here are some Dr. Baby pictures. 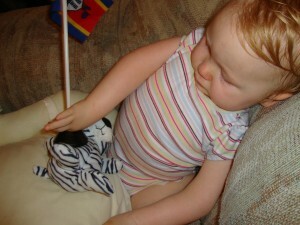 You remember when Laelia did occupational therapy stretches on her stuffed bear? Well here’s her caring for her new kitty. Some medicine for her stuffed kitty! Dr. Baby checks stuffed kitty’s chest. She got her own chest checked every hour or so in the hospital. Now she checks kitty’s vitals just to be safe. She’s using the base of a flag of Swaziland to do it. We just put Laelia down at her regular bed time. She’s doing better. We only have to wake her up for medicine one time tonight at 1:30 AM, so I’m hoping she will just go right back to bed. The heavy duty medicine is all out so we’re down to the cheaper, less powerful stuff. It smells better at least, but it would explain why she’s more fussy without the super meds. Mike and Iris brought us dinner tonight saving me the trouble. Before it was a nice distraction to make dinner while other people dealt with the crying, but tonight she was doing so much better that it was a joy to have the extra time to spend with her. She rolled over! Is she suppose to do that with a pin in her? I have no idea! Crazy kid! I’m dreading the next surgery, but am encouraged that it’s only been two days and she’s already laughing again. I can tell she’s in pain, but she is such a trooper. We had a few problems with the neighbors. Before the surgery our next door neighbor got the police called on him. He went crazy-go-nuts. Then the day before the surgery, he was back and smoking on the balcony into our apartment window (in our non-smoking complex) while Lali’s grandma who is deathly allergic to one of the chemicals in cigarettes was having an episode into a breathing mask. But am I going to go confront the police-dragged-me-away guy who was cussing at the top of his lungs the worst, vile things I’ve ever heard that woke up my baby at 2:00 AM last week? No. I want to live. The apartment manager did come to warn them that they would be sued by the owner if they kept it up. Then we had a couple of visits from police the day of the surgery while Lali’s grandparents were here, but we were at the hospital. They came right into the apartment, looked around, said “oops,” and went next door. They were responding to a couple calls on the neighbors and didn’t have the right apartment number. They made that mistake twice! Can we move now? Okay maybe I should go to bed now that baby is in bed. I just can’t stop doing doing doing. I only got a few hours of sleep. I should be crashing. Thanks for all the emails and texts and positive energy and tons of prayers from everyone! I haven’t been able to get back to everyone, but just know it’s appreciated! We got a couple letters in the mail that said just the right things. It’s so wonderful to have this support! There are even a few people we’ve never met who have been so wonderful! Thanks everyone! Bleh. Last night was not fun. Charley and I quickly discovered that we couldn’t take shifts when she only takes her milk from him and her medicine from me. And since she has to take calories with her medicine, we did this together all night. Charley still went to work this morning. Charley kept trying to call a doctor last night, but they didn’t return his calls even when he said he was an insurance company or doctor’s office, and the number we were given in case this very thing happened “closed” at 4:30 PM leaving no operator there to help. So then I called some numbers I was given after her first tendon releases when she was a newborn and one of those got through to a real person who got a doctor! We got into our pajamas then back into our clothes several times last night as decisions were made to take her to the emergency room and then plans changed. (Usually in tune with the texts, phone calls and facebook discussions happening around us. :)) Apparently last night I had no Mommy instincts whatsoever and was just waiting for someone to tell me what to do. Usually if it were not surgery-related I would just keep her home. But after a surgery, I was too scared to do that. But the doctor finally called us back around 10:30 PM as we were leaving for the emergency room, and told us to stay where we were since they had sent us home with all the medication we needed to handle this apparently. And sure enough we looked in our magical bag they gave us and saw medicine for the shakes, the higher fever, etc. Her temp was down to 101.5 by then and the doctor was happy about that. He says it’s not an infection unless it’s still around three days later. Of course he called us after we already had her awake and ready to go to the hospital, so she was pretty unhappy with us. At 1:30 AM she got more medicine and was down to 101.1. Then at 5:55 AM she was down to 100 even. Her shakes were also gone around that time too. Her throat is sore from screaming at us, but she’s looking a lot better this morning. Tired zombie mommy is going to take a nap now. 2:00 AM Update. Laelia’s not doing well. Her fever is down to 101.1, but she is now shaking and spasming. We gave her medicine for that specifically. Doctor is not too worried about the fever unless we can’t get it down more soon. He said she would have to have it another day or two before he would think it is infection. Her heart rate is through the roof though. She’s so pitiful looking–all teary-eyed, shaky and smelling like burned meat. It’s hard to see her like this. Laelia has a fever of 102, and it’s been high for a long time now. We tried to call the number they gave us in case this happened and they’re closed. So, yeah, great, thanks guys. She’s covered in cold washcloths, a diaper and her cast, and that’s it, but I can still feel the heat rolling off of her. She just had more medicine a little early too. So now we are debating whether or not to take her to the emergency room. She seems to be in more pain now too. Weird relapse? I don’t know. We have to stay up all night with her, so we’re taking shifts. If it gets higher than 102, or doesn’t at least go down a little soon, we’ll rush her back to the hospital. I hope we don’t have to do that since moving her seems to hurt a lot. Laelia did better at skipping breakfast and lunch than I thought she would. She just kept looking at us like we forgot something. Then when we packed up her stuff to leave, she really was barking at us. We were pretty good at distracting her during the two hour wait before surgery. We had to meet with the anaesthesiologist, surgeon’s fellow and head nurse. Then we changed her into her hospital gown and I tried to control my tears. They asked who would carry her to surgery and Charley responded, “Her mother,” faster than I could say, “I think I’m going to throw up.” I went to the restroom and did just that. After that I got on a mask, hair covering and gown of my own. Then I carried my confused little baby into the surgery room. I set her on the table and tried to calm her as they put the gas mask to her face. I wasn’t doing well so they kicked me out while she was still crying and struggling against the mask. It wasn’t the way I wanted to leave things, but I was about to pass out. The waiting began. Then everyone was distracting me, although I demanded more than peek-a-boo and stuffed animals. We waited for a billion years which actually turned out to be a little less than three hours. Then the surgeon came to tell us how it went. He said it went well and he only had to use one pin. He also decided to only work on three toes once he was in there. We’ll see how that will turn out. 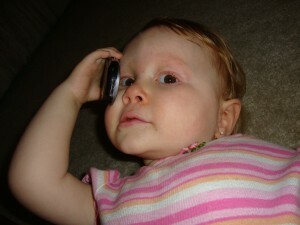 Then he said that she should wake up in about 45 minutes and one parent could see her at that time. Then we went back and waited again. This time I was going crazy. I had written on EVERY form I filled out that day that I wanted to be there the second she woke up (or even as she woke up), and was terrified that she would wake up and be alone and terrified. Then almost an hour later they called on the loud speaker for one parent of Laelia Wesley to go to recovery. So I left and went to recovery. AND NO ONE WAS THERE!!! I said, “Hello? !” in the worst, shaking voice, and NO ONE answered. Then I ran around the hall looking for another room marked recovery. Then I stopped two medical-type-looking menfolk walking down a hall and started panicking as I said, “My daughter! Where is she??! She was in surgery and now she’s not and.. WHERE IS MY DAUGHTER?! !” They directed me down a hall which turned out to be WRONG! Then I found another medical-type women (who I yelled at), and she directed me down a hall that ended at a door marked “hospital staff only” with no way to open it without a pass. And at this same exact moment I heard some little ones crying on the other side, and recognized one of those voices as my daughter. (I turned out to be right, but couldn’t know it for sure at the time.) So I began to pound on the door like a crazy woman. And I mean POUND. I tried to tear the door apart with my bear hands as my dad and sister (who finally came out to help me) backed away with a scared sort of look. Then someone came out and directed me back to the original room (now occupied with people), and showed me down a hall I didn’t see before to a window I was suppose to divine was where I waited for someone to notice me. Then I was told in a harsh tone, “Stay here,” as that women disappeared down another door for hospital staff only. I think my Christian response was something to the effect of, “Like hell I’m staying here.” So I followed her and pushed my way in. Then finally a nurse asked who I was here for (and said it like I was about to kidnap everyone in the room) and I said, “Laelia,” and they took me to my baby. Once I saw her I started balling. I got control of myself before I approached the bedside of my pitiful-looking child. When the harsh-toned nurse asked if I was “okay” in a tone that spoke volumes, I went off on a diatribe, “No, your incompetent, idiotic staff…” in a cooing tone while looking at my child and brushing her hair with my hand. I pretty much told the nurse off while hushing my child. 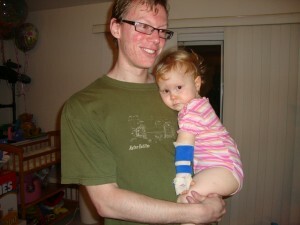 I had Laelia in my arms within moments (which was hard with the wires and leg cast) and she immediately calmed down. Then the nurse said I needed to put her back on the bed so they could wheel her to long-term recovery, to which I simply replied, “No.” So the nurse then went to another nurse and switched out. (See, I’m scary!) The new, slightly intimidated nurse asked if I would like to be wheeled into the other room in a wheelchair while I held my daughter. That’s better. I made sure to be incredibly sweet and nice to this new nurse. “I like you,” I responded, trying not to smile because I would show too many teeth and scare her away too. I guess Charley had the same experience as me when they finally called for other family. He came out and announced himself to the first person he saw with a clipboard, and was given a dirty look as that person took off. Then he just planted until we found him. Stupid system. Retarded! The thing I had worried about was that Laelia would freak out when waking up without her mom. Well, sad to say, I was right. Her heart rate climbed so high that she worried the staff. When I came in and she saw me, her heart rate immediately went down. When I went to the other side of the bed to pick her up, there was a moment when I was out of view and all her monitors started beeping loudly as her heart rate jumped up to 190! (100-120 is normal.) Then when she saw me again and I lifted her into my arms, her heart rate dropped down to normal. Now imagine being asked to put her back in the bed after that! But I was a good girl and didn’t kill the nurse. Once in the long-term recovery room I noticed just how out-of-it my baby looked. But she was alive. And surgery was over. And she was in my arms. She had a rocky start after that. Her oxygen was too low (making everything beep and a doctor run in), then her pulse was too high. Well, REALLY too high. It jumped up every single time I stopped physically touching her. At one point I put her in the bed and noticed both my legs and the arm she had been resting on were all asleep. So I had to put her in the hospital crib, but I leaned my whole self over her with my other arm under her and rubbed her tummy and chest with my free, rather numb hand. (It was a weird sensation to remove my hand from my daughter’s chest and at that same moment have two monitors punish me by beeping loudly! Her whole system was only going to behave if I was loving on her.) The thing that shocked me was how much pain she was in. She was so confused and scared. It was hard to see. I’ve never seen her like this. Her oxygen was making me dizzy and my back was killing me, but I didn’t realize it at the time. Only when Charley came back from his trip to the apartment and took over did I realize I had been standing and hunched over in that position for five hours. After that I threw up again and had other bad side effects from worrying. I’m realizing more and more than I’m a weakling when it comes to this stuff. She said her first words around 8:45 PM. She looked at me clearly (she had been pretty hazy up until this point) and said something like, “Ga boo ma ba?” Then her eyes hazed over again and she was crying. Then around 9:15 she allowed me to put her sippy cup in her mouth and she took a sip. Her throat burned (they put a tube down it that they didn’t tell us about) so she didn’t like that. Then they brought us some apple sauce and said she needed to get something down or they couldn’t release her the next day. So it was stressful when she couldn’t get anything (food or drink) down until eleven hours later! The next day we got books from her room and some other foods from home and she did much better. She was able to get down the apple sauce from the night before and also some crackers. That’s all we needed to be able to give her the oral medication… that she spit out. *Sigh* But then we tempted her with two hours of Elmo (kill me), and she did even better with the medicine. Elmo got grating by the end, but since she doesn’t watch tv at home, it was a special treat that kept her attention. Well, that, and reading her favorite book a literal 16 times in a row. Charley and I switched off for that one. Then we got to take out her IV and go home! She cried a bit in the car, but fell asleep. For some reason she didn’t like right turns. But we were so thrilled to get to take her home! When we got home we fed her more, more oral medication too, and had group nap time. It was great!Mommy, daddy, auntie Em, Grandma, Grandpa and baby all took a nap. We were tired! She was back in her own crib and was looking less pasty. Her lips were pink again and she had real clothes on! It was a sight for sore eyes. We fought off a bit of a fever after coming home, but it left as soon as it started. She ate her dinner fine. She has sat on the couch with her leg elevated while everyone takes turns distracting her since then. For the next surgery when the grandparents are gone, I may elicit help with this. It takes a lot to distract a post-surgery baby. But she’s doing so much better now that she’s home! She’s doing so well. So so well! She laughed! And she can focus her eyes! And she can eat! And she hasn’t thrown up once! And she’s swaying to some music right now. And she’s holding her stuffed kitty. And she’s telling us what sounds different animals make. She does cry when we move her or lift her, and she is fussier than usual, but I’m so happy with how she’s doing. I really thought after our rocky start that she would not be doing well. I was thinking the worst. I’ve been feeling her heart and it’s normal. She got a bit more out of her lungs too. She’s kinda raspy and the nurses and assistants asked me if she had a cold before surgery… um, no, I’m not that stupid. But then the doctor informed them and us that this was normal for post-op. We cheer when she can cough it out. We cheer when she eats. We cheer when she says anything. She’s pretty spoiled. And that’s how it should be. I honestly have no earthly idea how we are going to do all this again in two weeks. But that’s still the plan. And her left foot is worst off so it may take longer. I’ll be glad when it’s all over with. But at least this next time I’ll know exactly where to go for recovery. And Charley will be the one to carry her into surgery. And we’ll know what stuff to bring. And maybe we can borrow a computer so we can give better, more timely updates. Lots of things to plan.